April arrived on cue in Preston complete with a series of blustery showers to reinforce its reputation. 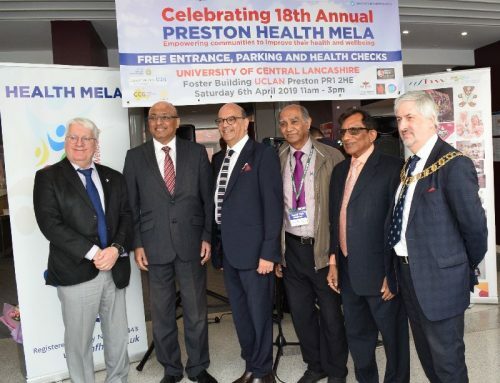 Fortunately, nothing the weather had to offer could dampen the enthusiasm of around 1700 Prestonians and visitors from further afield, who arrived to join in and enhance the reputation of the annual Preston Health Mela now sixteen years young! 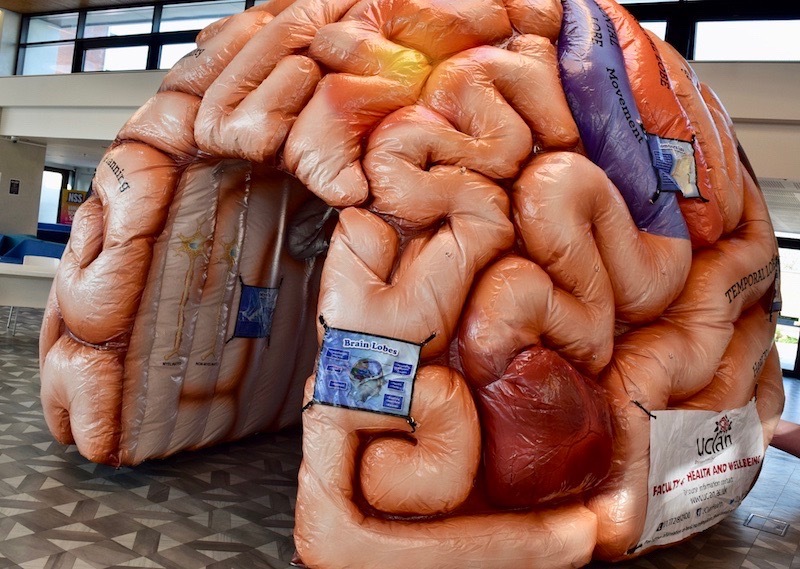 in its joyful celebration of community health and wellbeing. 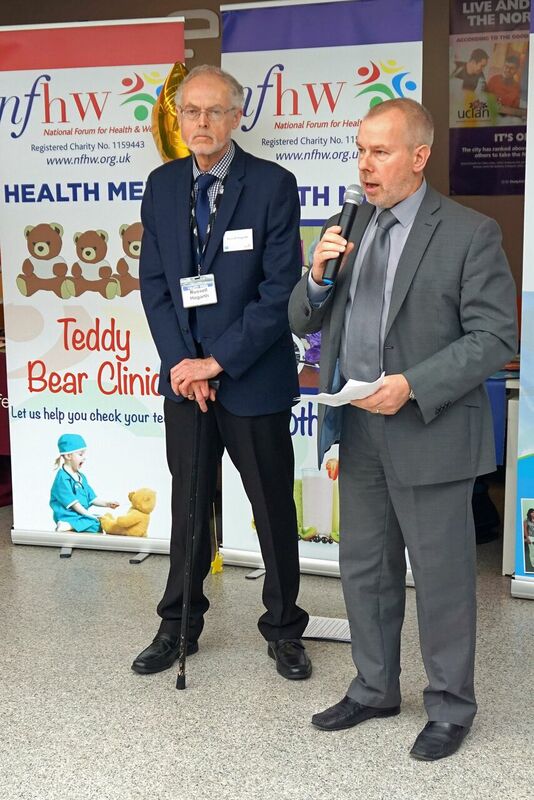 Hosted for the third consecutive year by the University of Central Lancashire in its friendly Foster Building, this annual health fair is organised by the National Forum for Health and Wellbeing in collaboration with UCLAN, local NHS Trusts and a wide range of voluntary organisations. The Mela commenced with a breakfast meeting on the theme ‘Healthy Children – Healthy Adults – Healthy NHS’ with contributions from speakers John Collins, Mayor of Preston, Nigel Harrison, Executive Dean of Health and Wellbeing at UCLAN, Sue Musson, Chair of Lancashire Teaching Hospitals NHS Foundation Trust, David Eva, Chair of Lancashire Care Trust and Seth Crofts, Pro-vice Chancellor of the Edge Hill University. The formal opening ceremony was presided over by the Mayor and distinguished guests. After a welcoming ‘Bollywood’ Dance sponsored by the Gujarat Hindu Society, visitors to the Mela then encountered a series of thought provoking experiences to change their perceptions of the National Health Service and how to make use of it to secure health and wellbeing for themselves and their families. 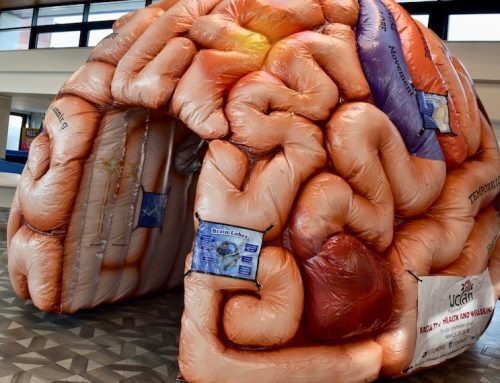 The chance to take a relaxed ‘Health MOT’ with checks on blood pressure, body mass index, blood sugar and cholesterol levels, followed by personally tailored counselling from friendly health professionals. One hundred and fifty six visitors took up this very popular offer of whom 41 (26.3%) were referred to their GP for further investigation. 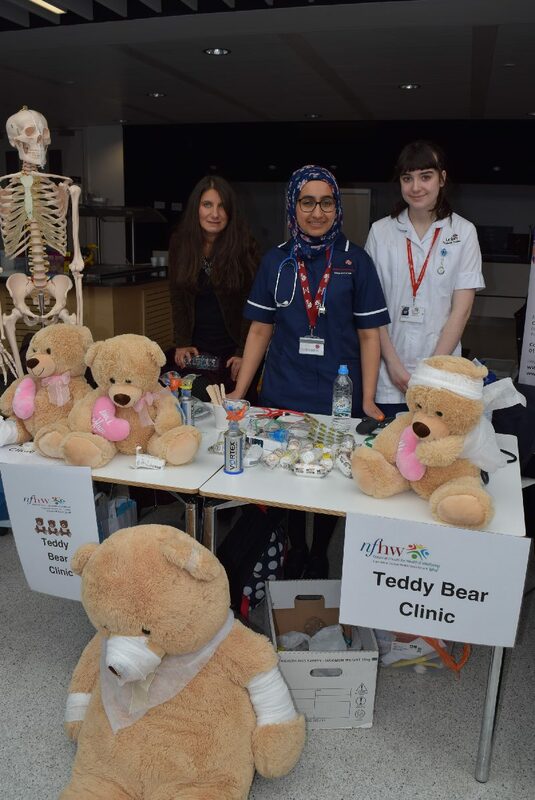 Appointments at the ‘Teddy Bears’ Clinic. Visitors found much more! 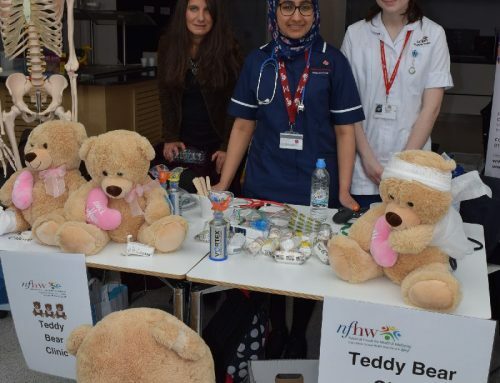 For those with relaxation in mind -what better than a taster session of Reiki under the supervision of a Reiki Grand Master – 35 visitors took part – or maybe pedal towards a healthy drink on the smoothie bike. 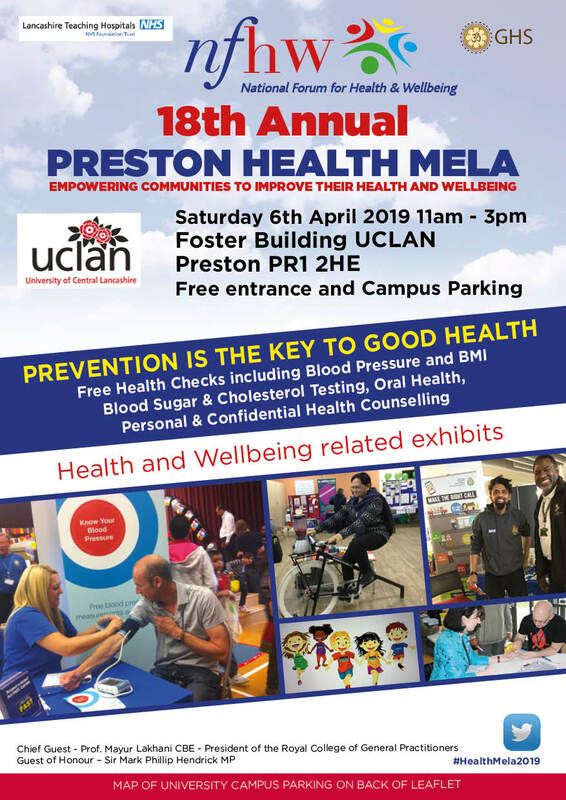 Once re-energised, perhaps the chance to talk to a wide range of friendly health professionals and volunteers about their work in promoting community wellbeing. Then maybe try out Henna painting – and don’t forget the Health MOT. 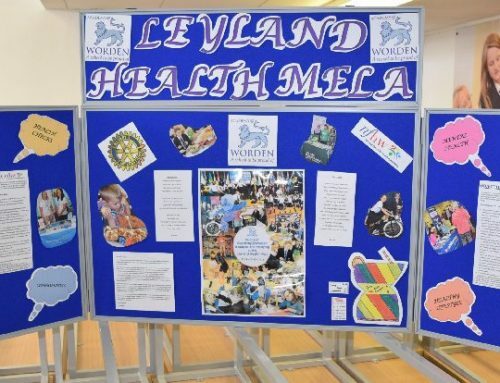 There’s something for everyone at a Health Mela! 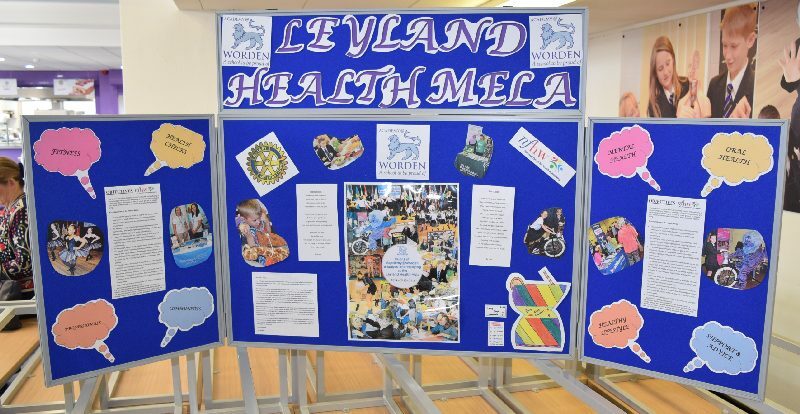 The Mela’s unique ‘Children’s Drop In Theatre’ was designed to engage with and enthuse the younger generation and to help them develop a deep and enduring understanding of the importance of adopting healthy life styles and the idea of a health community. 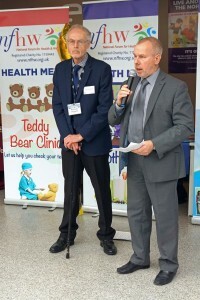 More than 250 individuals visited the theatre event including a high proportion of c hildren. During the programme, short and lively sessions on oral hygiene, bone health, relaxation etc. were combined with the enthusiastic presentations of the children who were the real stars of this inspiring show. 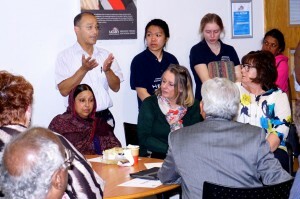 Typical of the thought provoking contributions was the video presentation showing children from the Al-Huda Academy Preston undertaking their award-winning project. This involved the children in getting to know residents of the Lady Elsie Finney House Care Home. Many in the audience were moved to tears by this heart-warming record of communication across cultures and generations. Other inspiring contributions came from musician Alice Robson, poetry readers Fatima and Zainab from Blackburn and children from the Madni Institute, Preston. NFHW is especially grateful to all the teachers and children who worked so hard to help us in this new and exciting addition to the content of our Health Melas. Ove rall we believe that the 2017 Health Mela will be judged a great success. We record our enormous gratitude to the very many individuals and organisations without whose contribution this event could never have taken place. 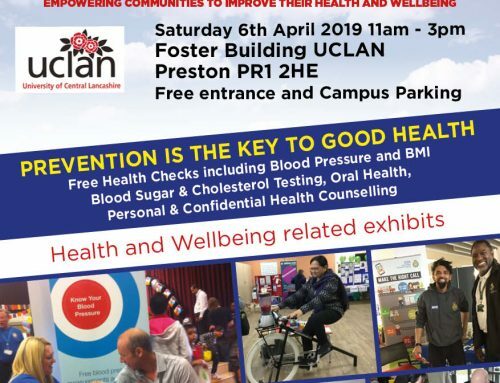 In particular we recognise the very generous support received from UCLAN – a very tangible indication of the University’s commitment to the promotion of community health and wellbeing. 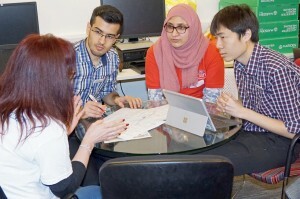 The organisers also wish to record their sincere thanks to all the student and other volunteers who played so many vital roles in securing the success of the event. 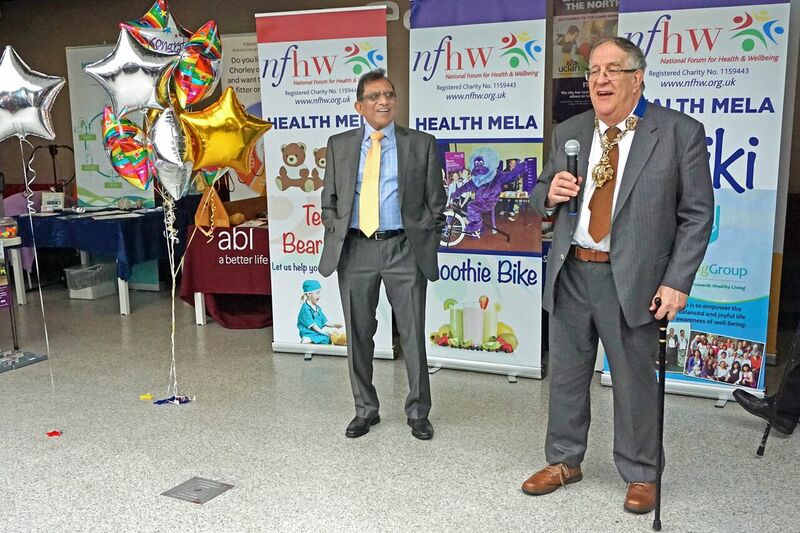 NFHW has now organised over 40 successful Health Melas across the North West and further afield.